First battle of the Revolution in North Carolina, Feb. 27, 1776. Tories defeated. U.S. Military Park, 5 mi. S.W. 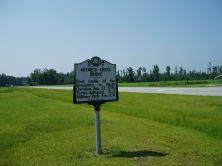 Although the battles of Lexington and Concord were the opening volleys of the Revolutionary War, the first sounds of freedom in North Carolina were cracks from Patriot muskets concealed behind the tree line near Moore’s Creek Bridge in present Pender County. Not only was the first battle in North Carolina a decisive victory for the Patriots, the sound Loyalist defeat signified the end of royal government in the colony, which emboldened North Carolina colonists to declare independence two months later. After many colonists rejected economic measures such as the Stamp Act of 1665, Britain relied on loyal governors to prevent colonies from rebelling. In January of 1776, exiled governor Josiah Martin began augmenting British troops in North Carolina with Tories in an attempt to re-establish royal rule in the colony. In the middle of February, more than 1,500 Tories, most of them Scottish Highlanders, gathered under General Donald McDonald at Cross Hill, on Cross Creek, present day Fayetteville. At the same time, Patriot forces had anticipated a Loyalist campaign directed toward the strategic port of Wilmington and Colonel James Moore met Colonels Richard Caswell and Alexander Lillington near Moore’s Creek in order to intercept McDonald. During an early morning march near Moore’s Creek on February 27, Loyalist forces discovered a Patriot encampment that, unbeknownst to them, had been abandoned although the campfires were still burning. While a Loyalist force of almost 2,000 prepared to pursue an army believed to be retreating across a narrow bridge over Moore’s Creek, a combined Patriot force of over 1,000 greased planks along that bridge and built platforms above the creek to ambush the enemy. Just after sunrise, Loyalist elements, led by Lieutenant Colonel Donald McLeod, stormed the narrow bridge. In the subsequent ambush, confusion gave way to slaughter as 900 Loyalists, including Mcleod, were killed, wounded, or captured. 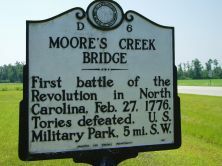 The Battle of Moore’s Creek Bridge was a pivotal moment in North Carolina history. Without Loyalist forces to protect the colonial government, the royal system collapsed, allowing Patriot leaders the chance to establish a fledgling state government. The Patriot victory also denied Britain use of North Carolina’s ports, which were logistically significant. As the battle at Moore’s Creek is often referred to as the “Lexington and Concord of the South,” the victory marked the beginning of the end for British rule in America. The Moore’s Creek Battleground now belongs to America. In the middle of the nineteenth century, it was designated a state park, and later deeded to the National Parks Service. In addition to the remnants of the bridge and earthworks used in the battle, monuments salute both armies of the battle, along with women, who made significant contributions throughout the Revolutionary War.